I had the privilege of seeing on the 1st of February “Mr. Turner,” the wonderful film directed by Mike Leigh and featuring Timothy Spall in the title role. It is an extraordinary film, and if you know the artist’s work, you will enjoy it as much as I did. I was totally drawn into it and when it ended, after two and a half hours, I thought the time had gone by very quickly. Others might find it a bit dreary, certainly not action-packed, and with no violence nor explosions. Even the burning of the British Houses of Parliament in 1834, which he witnessed and painted, is not featured at all. I have always loved Turner’s work. I remember as an art student spending hours at the Tate Gallery in the Turner Rooms. The last time I visited the Tate Britain and its Clore Galery where the Turner collection is now displayed, was on Sunday, 19th May, 2002. I was in Great Britain to do some research on the etcher Ernest Stephen Lumdsen (1883-1948) for an exhibition at the Burnaby Art Gallery and its attendant publication (2003). I had flown into Manchester that weekend, and having noted that Sunday was the last day to see The American Sublime exhibition at the Tate Britain, I took a train to London from Manchester in the early morning and spent the entire day at the Tate before returning that evening, and then going on to Edinburgh the following day. I did spend several hours in The American Sublime exhibition. It is probably the most I have ever spent to see an exhibition, including train fare and exhibition catalogue, but it was worth every penny. To gild the lily, I spent the couple of hours I had left looking at Turner’s work again in the Clore Gallery. At that time I was also a sessional teacher at Okanagan University College (now University of British Columbia Okanagan) teaching art history, including 19th century art history. Of course, the idea of the Sublime was an important aspect of 19th century art, and this was an opportunity to see what it was all about, in its American incarnation. Many American artists inspired by the Sublime knew and admired Turner’s work. Turner’s Sublime is summed up in his early painting, Snowstorm: Hannibal Crossing the Alps (1812). J.M.W. Turner, Snowstorm: Hannibal and His Army Crossing the Alps, 1812, oil on canvas, 144.7 x 236 cm, Tate Britain. The work was done during the long period when British artists could not travel to the Continent because of the ongoing war with France (1792-1815). The painting is a veiled allusion to the crossing of the Alps by Napoleon in 1800, and suggests that, like the Carthaginian Empire, his dreams of empire are doomed. The cataclysm depicted here, a stormy vortex, is a powerful expression of the sublime forces of nature, and it is really this depiction of nature that would be the key to Turner’s paintings in the years to come, though many works also alluded to Britain’s own imperial power, especially the power of its Navy. This painting was not the first nor the last time Turner used the vortex as a dominant compositional device. In 1800, at the age of 24, he submitted his Fifth Plague of Egypt, which inspired the appropriate awe. J.M.W. 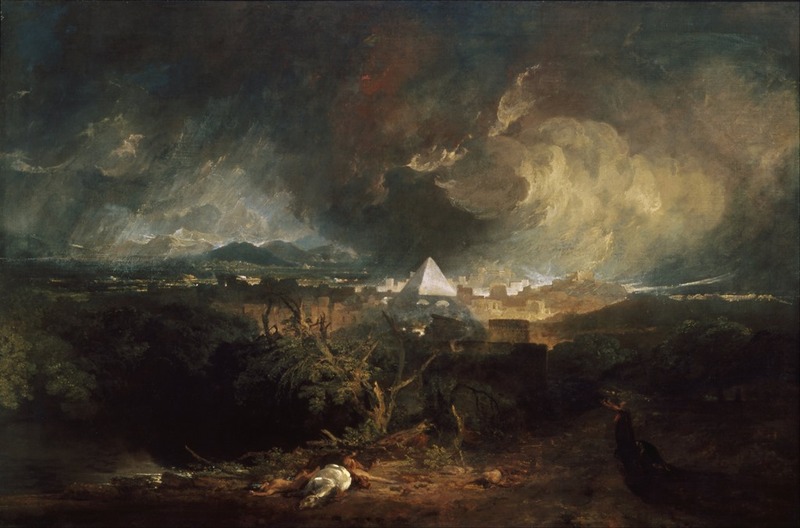 Turner, The Fifth Plague of Egypt, 1800, oil on canvas, 120 x 180 cm, Indianapolis Museum of Art. Turner was not the only painter working in the Sublime manner, but he gained prestige by adapting his primary interests as a landscape painter to some kind of myth, Biblical or poetic, and many of his paintings would include a narrative pretext, but it was always about nature, light and darkness. The movie focuses on the last three decades of Turner’s life and presumably begins in about 1825 or so when he is seen sketching a sunset in the Netherlands. (His first trip to the Netherlands dates from 1817). He is already famous and his house also contains his own gallery. Typical of Turner’s work at that time was his Dido Building Carthage (1815) and in that painting and many others, he shows the influence of the French painter Claude Lorrain (1600-1682) who was held in such high esteem by British collectors. Claude Lorrain (1600-1682) The Embarkation of the Queen of Sheba, 1648, oil on canvas, 149 x 194 cm, National Gallery, London. 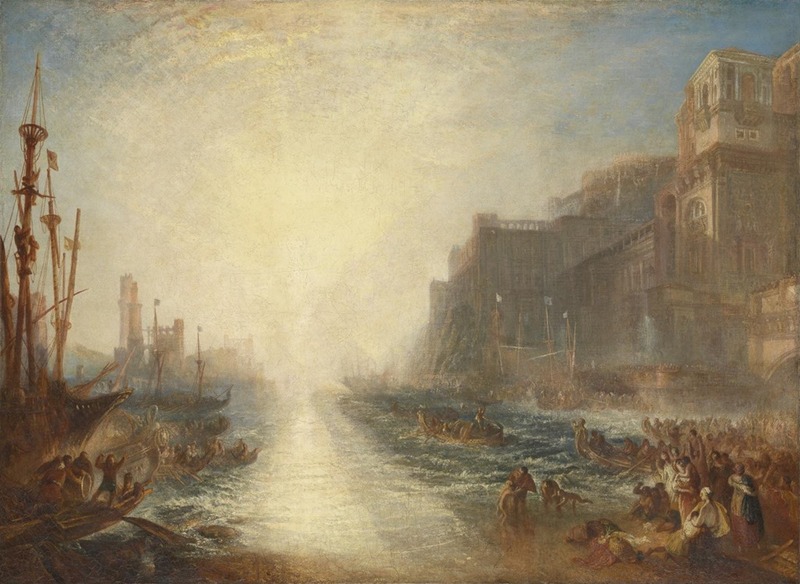 Turner considered the Lorrain painting his masterpiece and painted his Dido Building Carthage in 1815, as an homage to it. He would eventually bequeath it to the British nation with the proviso that it be exhibited alongside the Lorrain in the National Gallery. And that is where you can see it to this day. J.M.W. Turner, Dido Building Carthage, 1815, oil on canvas, 155.5 x 230 cm, National Gallery, London. Turner was not afraid to be compared to Claude Lorrain, which indicates how highly he thought of his own work. He revisited stories from the Carthaginian Empire, with a Decline of the Carthaginian Empire (1817), also in the National Gallery. How well I remember the occasions I stood in that room contemplating these extraordinary works! Another work is his Regulus. This painting is a key to Turner’s work I think, although certainly not one of his best known. The story is that of the Roman general Regulus, captured by the Carthaginians, and sent to Rome to negotiate a peace treaty. He instead convinces the Romans to reject the terms, and true to his word, he returns to Carthage to face a certain death. Among his tortures was to have his eyelids cut so he would be blinded by the sun. J.M.W. Turner, Regulus, 1828, reworked in 1837, oil on canvas, 89.5 x 123.8 cm, Tate Gallery. The painting shows Regulus leaving Rome for Carthage as he had promised. His eventual blinding is foreshadowed in this painting. I was reminded of this painting recently when I visited an ophthalmologist and had some of those pupil dilating eye drops. They make you see light in all its intensity for a few hours. I could not help thinking of Turner! Gradually, it is the intensity of light that comes to dominate Turner’s work, not to mention an intensity of colour. 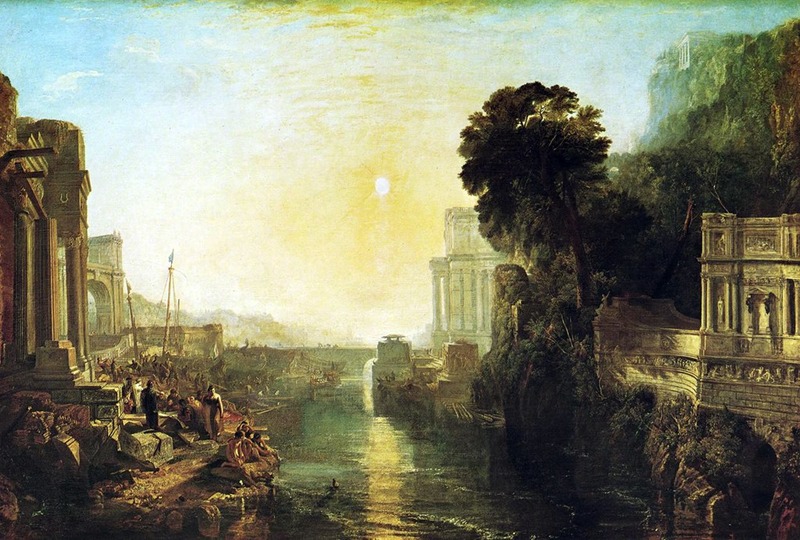 The subject becomes a pretext for Turner’s abiding interest in the effects of sunlight. The movie, “Mr. Turner” often shows Turner sketching in the landscape with low sun, fog, clouds and even steam belching from steamboats or steam locomotives. An example is the painting of the Téméraire (above), and the movie, “Mr. Turner,” re-enacts the scene where the artist and some of his friends are witnessing the event from the water. It is one example of an event shown in the movie to great effect. The juxtaposition of a sailing man-o-war being towed to be scrapped by a small steam tug is poignant. It is the passing of an era. Apparently Turner, in fact, did not witness the event, but was very eager to make this contemporary event the subject of a painting. The ship had been dismasted at Trafalgar, but Turner depicts her with all her rigging. J.M.W. 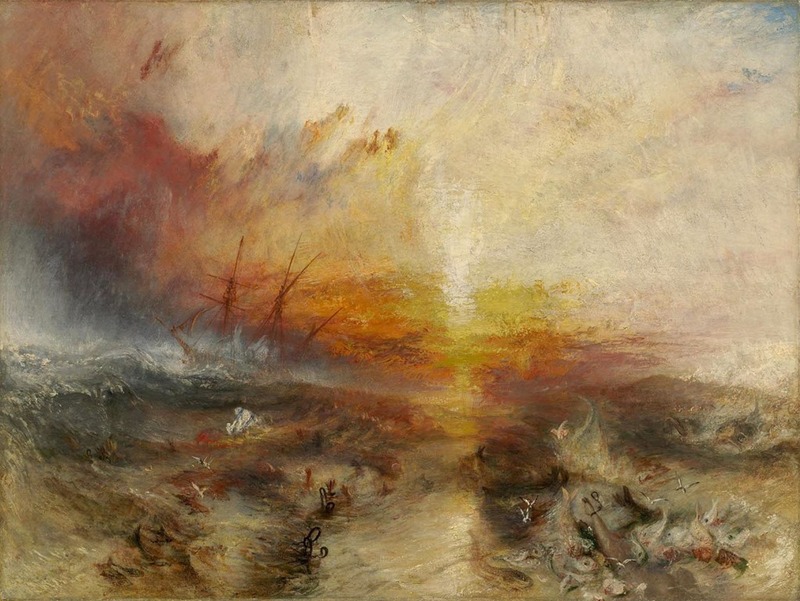 Turner, The Slave Ship (Slavers Throwing Overboard the Dead and Dying, Typhoon Coming On), 1840, oil on canvas, 90.8 x 122.6 cm, Museum of Fine Arts, Boston. The same can be said for his painting of the Slave Ship. In the movie, this painting is owned by the critic John Ruskin’s father, and it is worth reading Ruskin’s description of it in Modern Painters. 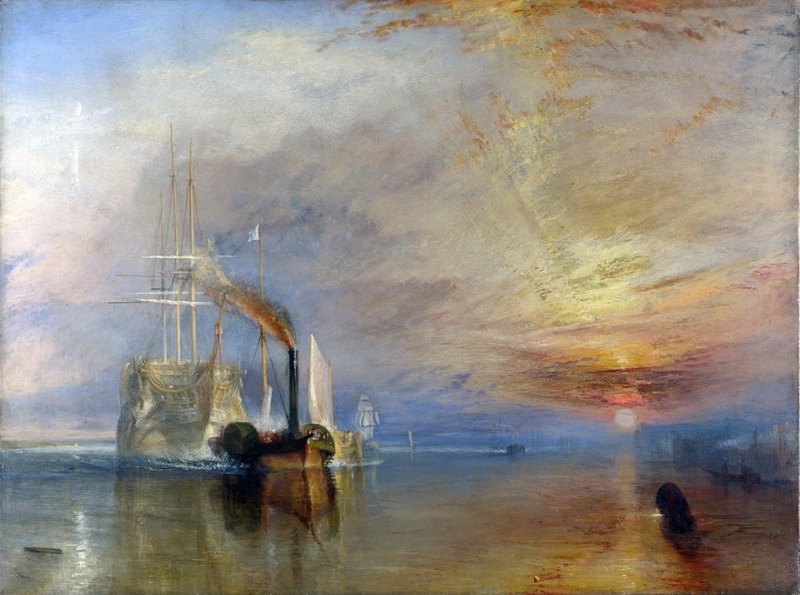 The characterization of Ruskin in the movie is priceless, and although Ruskin was one of Turner’s great champions, he did not like paintings where Turner included contemporary subject matter, such as steamboats, in his work. 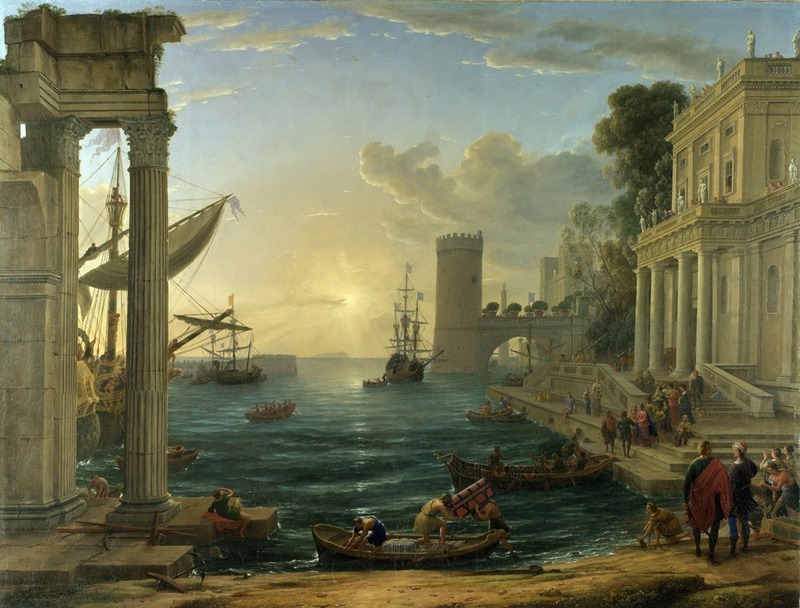 The movie also shows Ruskin being very critical of Claude Lorrain, an opinion which Turner certainly did not share. J.M.W. 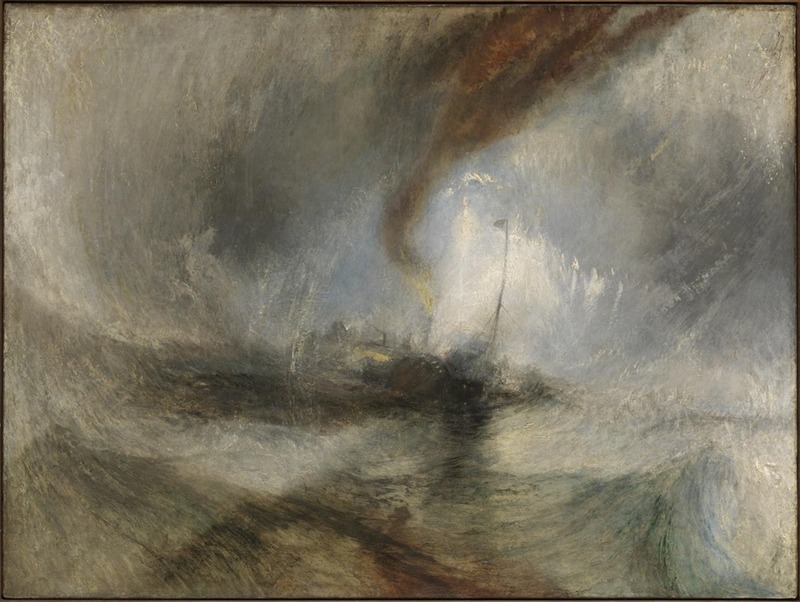 Turner, Snow Storm – Steam Boat off a Harbour’s Mouth making signals in Shallow Water, and going by the Lead. The Author was in this Storm on the Night the Ariel left Harwich, 1842, oil on canvas, 91.4 x 121.9 cm, Tate Gallery. Turner’s life-long admiration of Lorrain did not prevent him from depicting contemporary events. In his Snow Storm, he gives heroic treatment to an unnamed steam boat tossed about in a turbulent sea, a scene he observed himself. Once again, the vortex dominates the chilling composition of a steam boat in distress, with lights, clouds and rain drawing in the viewer. J.M.W. 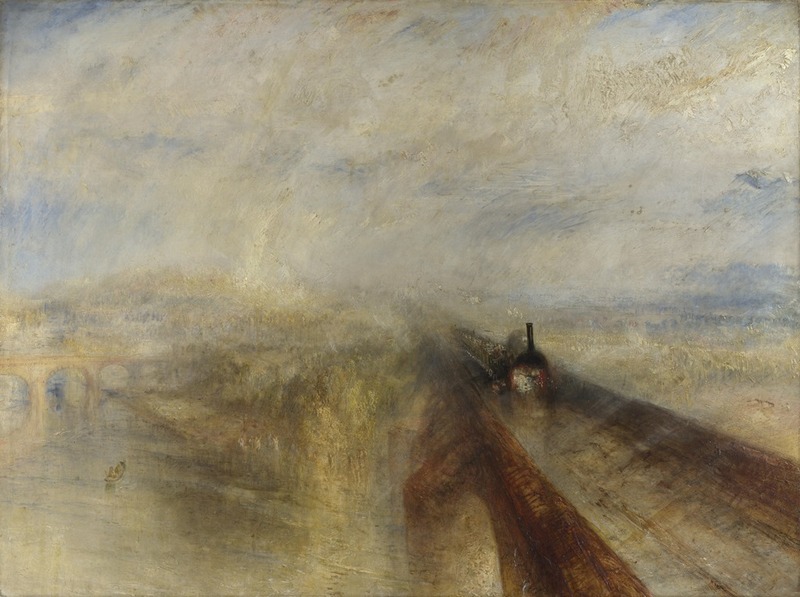 Turner, Rain, Steam and Speed – the Great Western Railway, 1844, oil on canvas, 91 x 121.8 cm, National Gallery, London. Turner’s use of contemporary subject matter, such as steam locomotives, astonished his viewers. Such subject matter was usually shunned by Turner’s colleagues of the Royal Academy, but Turner who witnessed the transformation of Britain as a result of the Industrial Revolution, was fascinated by the visual effects. This painting too is re-enacted in the film to great effect. J.M.W. Turner, The Angel Standing in the Sun, 1846, oil on canvas, 78.7 x 78.7 cm, Tate Gallery. In addition to his fascination with the scenes of modern life, Turner often turned to literature for his inspiration. 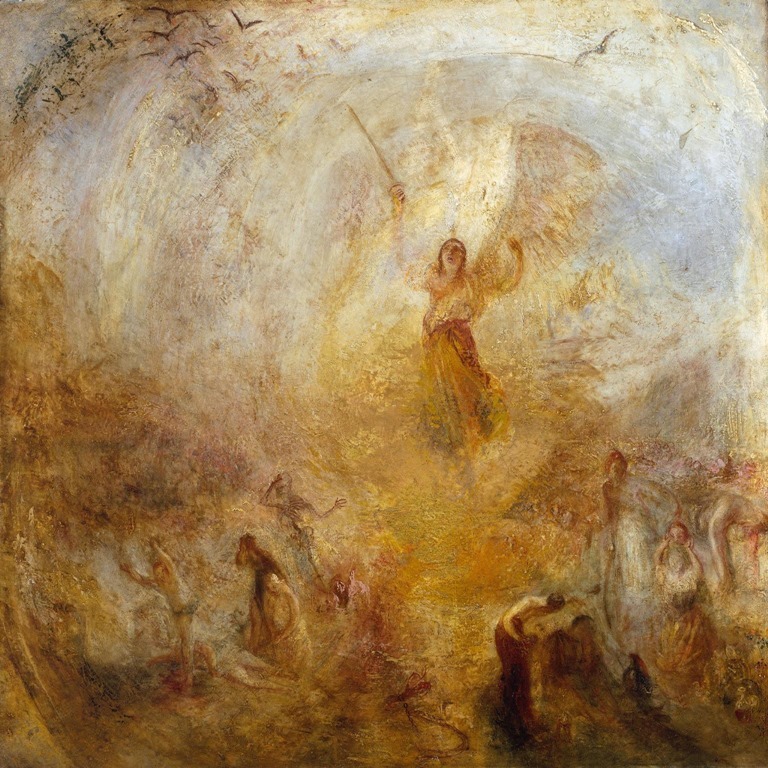 The Angel Standing in the Sun is inspired by the Apocalypse, and the extraordinary images conjured up by John the Evangelist (Revelation 19:17) must have enthralled Turner, although he was not a religious man. 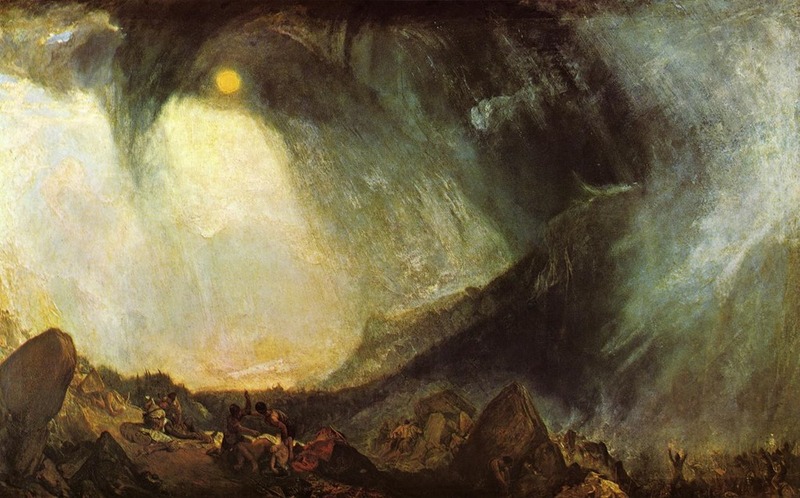 The key to Turner’s beliefs are expressed by his last words, “The sun is God, ha-ha-ha.” Certainly his paintings had expressed these beliefs throughout his life. Brown, David B., ed. J.M.W. Turner – Painting Set Free. Los Angeles: The John Paul Getty Museum, 2014. Venning, Barry. Turner. London: Phaidon Press, 2003. Works reproduced here are in the public domain.